Local villagers in Mullaitivu have documented how a Sinhala Buddhist monk has been leading increasing efforts to construct a large Buddha statute that encroaches on a generations old Hindu temple. The construction, which is taking place in the Karaiththuraipattu division in Mullaitivu, is reportedly being supported by Sri Lanka’s archaeological department. When Tamil journalists visited the region to document the building of the statue, Sinhala constructers began to photograph the journalists in an effort to intimidate them. 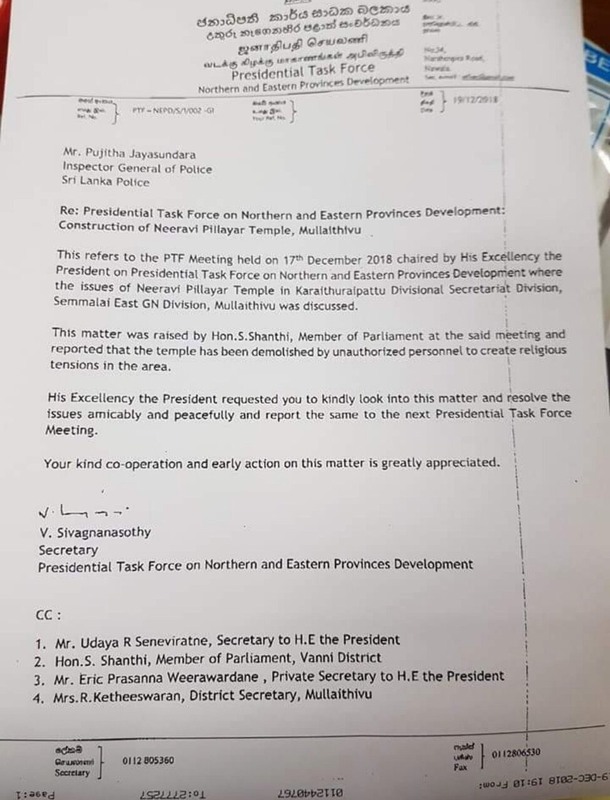 The issue was raised last month by the secretary to Presidential Task Force on Northern and Eastern Provinces Development, who called on Sri Lanka’s president Maithripala Sirisena to “resolve the issues amicably and peacefully”. Tamil villagers have also expressed fears that the Neeraviyadi Pillaiyar temple will be brought under the control of the occupying Sinhala monk once the construction is complete. In 2013, a Sinhala Buddhist monk from Maradana – Colombe Medalange – had with the help of the Sri Lankan army set up a hut on the occupied temple’s land and taken up residence there.